Secret Farm: A garden blog: Beans! Beans! Beans! It seems about this time every summer I realize, holy crap! I haven't been blogging! And then I quickly write a post such as this. Well, I apologize once again dear readers - if there are any of you left. I promise to try and keep up, but as you other MN gardeners know, it is just coming in to major harvest time and well, it can be kinda busy. Actually though, all summer is busy so, I dunno. Is there really any down time in gardening? What is your busiest time in the garden? Mine's gotta be spring, but then again all my berries went nuts this year and I spent a good 2 hours or so every day after work just picking them late spring/early summer when I had other junk to get done with planting and weeding etc. Oh well, always behind. Now the beans are kickin' it as the title of this post suggests. I really planted a lot this year and also at least 4 varieties, including a climbing green bean this year which I have never done before. So far it is not as prolific as the bush ones, so we'll see if I plant them again next year. They do save space though and that is one thing at a premium for sure in my garden. Tomorrow I hope to pick my first ripe tomato - a bit later than most everyone else, but I got mine in late too. Perhaps I'll even post about it tomorrow! 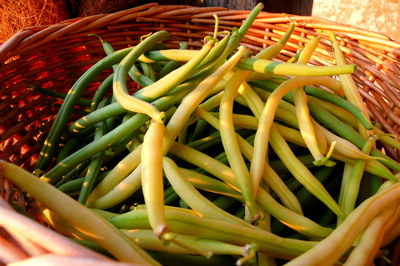 In the mean time, anyone got any great green bean recipes they like? your garden is truely beautiful, I am very jealous.